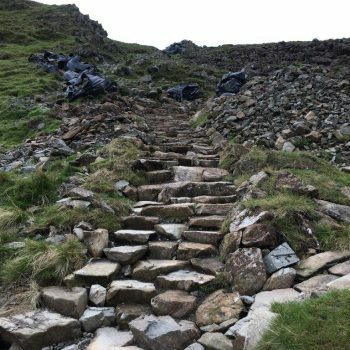 Since completing the Scafell Pike summit cairn rebuild in May we have alternated between our Government funded RPA project on Scarth Gap in Buttermere and path definition work on both Great Gable’s North East approach from Honister (the route many people will be using on November 11th for the WW1 centenary commemoration) and Scafell Pike’s Lingmell col approach. 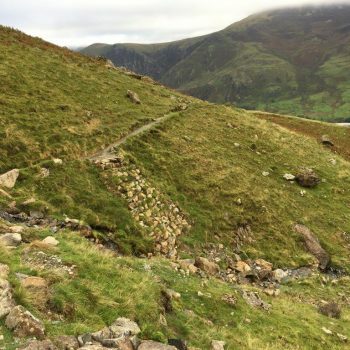 One of the most challenging tasks was to get stone for a revetment on Scarth Gap safely to the construction site below the path from the helibag drop site above it. The solution was an ingeniously simple one of slowly swinging stones a few at a time in a helibag attached by rope to a fixed point above the path in a pendulum style movement. 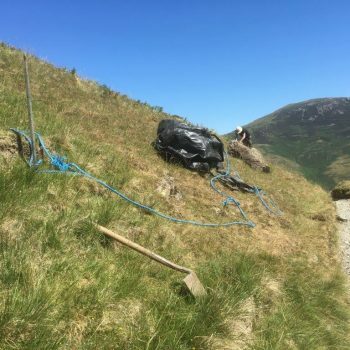 This took away the hazards of using winching equipment to try and steadily lower stone over the path edge down a rough and steeply uneven hillside, relying instead on the angle of swing to allow the stones to reach the required height. The completed structure has blended very well into the grassy hillside. 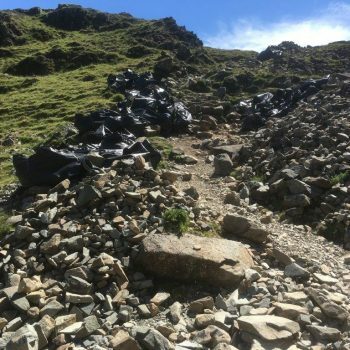 Our team of eager FTF volunteers have kept the work progressing well with their weekly work parties, leaving two of the footpath team free to concentrate on the more technically challenging section of pitching at the very top of the pass. The transformation of a heap of stony rubble into a defined and landscaped path has been quite impressive. We successfully completed all the stonework within the end of September time limit with a sense of non-triumphalistic relief.